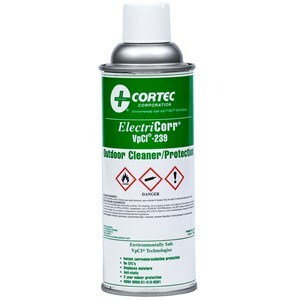 ElectriCorr VpCI-239 is a multifunctional outdoor cleaner/corrosion protector. Its continuous Vapor phase Corrosion Inhibitor action saves money by extending product life and eliminating downtime due to corrosion. ElectriCorr VpCI-239 forms a very thin film proven effective against aggressive conditions including industrial, marine and tropical regions. This film does not alter the electrical resistance or magnetic properties of metal substrates. ElectriCorr VpCI-239 can be safely applied for the corrosion protection of electronic circuits or relays without causing any significant changes in conductivity. ElectriCorr VpCI-239 can be safely used with most plastics, elastomers, and other non-metallics. In addition to corrosion protection, ElectriCorr VpCI-239 is an excellent contact cleaner of oils, grime and other contaminants. 9.45 oz. aerosol spray. ElectriCorr VpCI-239 is an effective outdoor inhibitor of galvanic corrosion for most metals and alloys normally found in electrical and electronic applications such as aluminum, copper, tin, and ferrous metals. ElectriCorr VpCI-239 is free of CFCs and 1,1,1- Trichlorethane. Provides instant corrosion protection. Protects high or low voltage and high or low current electrical and electronic devices such as relays, connectors, sensors, wiring, etc. Spray a very light mist over the area needing protection. Dry time is approximately 1-2 hours at 70F and 50% relative humidity. Note: Application of a heavy mist will result in a heavy film that sags and remains wet. More is not necessarily better and could cause fouling or other complications of electrical connections. ElectriCorr VpCI-239 should be kept from high temperatures and in normal warehouse conditions to prevent from freezing. ElectriCorr VpCI-239 has a shelflife of 3+ years in sealed packages.